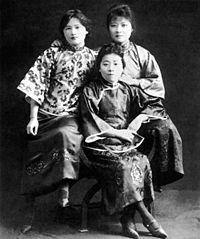 The Soong sisters (simplified Chinese: 宋氏三姐妹; traditional Chinese: 宋家姐妹; pinyin: Sòngjiā Jiěmèi) were three Shanghainese (of Hainanese descent) Chinese women who were, along with their husbands, amongst China's most significant political figures of the early 20th century. They each played a major role in influencing their husbands, who, along with their own positions of power, ultimately changed the course of Chinese history. Their father was American-educated Methodist minister Charlie Soong, who made a fortune in banking and printing. Their mother was Ni Kwei-tseng (倪桂珍 Ní Guìzhēn), whose mother, Lady Xu, was a descendant of Ming dynasty mathematician and Jesuit convert Xu Guangqi. All three sisters attended Wesleyan College in Macon, Georgia, United States. Mei-ling, however, left Wesleyan and eventually graduated from Wellesley College in Massachusetts. Their three brothers were all high-ranking officials in the Republic of China government, one of whom was T. V. Soong. Throughout their lifetimes, each one of the sisters followed her own beliefs in terms of supporting the Kuomintang (KMT; Nationalists) or the Communists. In the 1930s, Soong Ai-ling and Mei-ling were the two richest women in China; both of them supported the Nationalists. In 1937, when the Second Sino-Japanese war broke out, all three of them got together after a 10-year separation in an effort to unite the KMT and CPC against the Imperial Japanese army. Soong Ai-ling devoted herself to social work such as helping wounded soldiers, refugees and orphans. She donated five ambulances and 37 trucks to the army in Shanghai and the air force, along with 500 leather uniforms. When the Japanese occupied Nanjing and Wuhan, the three sisters moved to Hong Kong. In 1940, they returned to Chongqing and established the Chinese Industrial Cooperatives, which opened job opportunities for people through weaving, sewing and other crafts. The sisters frequently visited schools, hospitals, orphanages, air raid shelters and aided war torn communities along the way. While both parties failed to unite at the most critical time in the 1940s, the sisters made a valiant effort in financing and assisting in all national activities. Pinyin: Sòng Ǎilíng The eldest sister (1888–1973). She was married to China's richest man and finance minister, H. H. Kung. Pinyin: Sòng Qìnglíng The middle sister (1893–1981). She married Sun Yat-sen, Father of Modern China and first president of the Republic of China, in Japan on 25 October 1915. She later broke with her family and supported the Communists, remaining on the mainland after the Communist takeover. She became joint vice president of the People's Republic of China with Dong Biwu from 1959 to 1972 and honorary President in 1981, just before her death. Pinyin: Sòng Měilíng The youngest sister (1898–2003). She was a prominent political leader in her own right, the wife and partner in power of Chiang Kai-shek, the leader of the Kuomintang (KMT), commander in chief of the Chinese armies and later president of the Republic of China. Their marriages and alleged motivations have been summarized in the Maoist saying "One loved money, one loved power, one loved her country" (Chinese: 一個愛錢、一個愛權、一個愛國; pinyin: Yīgè ài qián, yīgè ài quán, yīgè àiguó) referring to Ai-ling, Mei-ling, and Ching-ling in that order. The Soong Sisters, the award-winning 1997 Hong Kong film depicting the lives of the sisters. The Soong Sisters, a 1941 book by Emily Hahn. The Soong Dynasty, a 1985 book by Sterling Seagrave, ISBN 978-0-283-99238-4. ^ "Catholic Dictionary entry for Xu Guangqi". Retrieved 11 September 2010. ^ "The Soong Sisters". History of the College. Archived from the original on 27 September 2011. Retrieved 3 October 2011. ^ a b c Peterson, Barbara Bennett (ed.). (2000). Notable Women of China: Shang Dynasty to the Early 20th century. M.E. Sharp publishing. ISBN 0-7656-0504-X.